The 2018 Chrysler 300 stands the test of time with its distinctive lineage of power, luxury and everlasting style. It may sound pretty far fetched to imagine a sedan that emulates bold, American style while maintaining a quiet interior cabin, but the 2018 Chrysler 300 has it all. The 2018 Chrysler 300 is offered in five trim levels – 300 Touring, 300 Touring L, 300S, 300 Limited and 300C. With the exception of the 300C trim, the Chrysler 300 lineup shares a standard 3.6-liter V6 24-valve VVT engine that delivers 292 horsepower and 260 lb-ft of torque. However, the 300C trim (optional on the 300S) is standard equipped with a 5.7-liter V8 HEMI MDS VVT engine that delivers 363 horsepower and 394 lb-ft of torque – which is the most powerful V8 engine in its class. Additionally, the 3.6L and 5.7L engines are both paired to an eight-speed automatic transmission and have a fuel economy of 19 mpg in the city and 30 on the highway. Shared mechanical features throughout the entire 300 lineup include 730-amp maintenance free battery, black rotary shifter, conventional differential rear axle, electric power steering, engine oil cooler plus standard duty engine cooling. Standard on the 2018 Chrysler 300 Touring, 300 Touring L, and 300 Limited is a base engine controller. Utilized to assist the engine in reaching maximum performance and efficiency, the base engine controller determines fuel ratio, ignition timing, idle speed and variable valve timing. Due to the Chrysler 300 C’s more powerful 5.7L engine, it’s equipped with a high speed engine controller. The Chrysler 300C is only available with rear-wheel drive, while the 300 Touring, 300 Touring L, 300S and 300 Limited are available with all-wheel-drive or rear-wheel-drive. Finally, an engine block heater is an available option on all trims. Adding to the Chrysler 300’s sleek and stylish exterior design, all trim levels share exterior mirrors with a heating element, remote fuel door release, rear window defroster, dual rear exhaust with bright tips, solar controlled glass and an optional dual-pane panoramic sunroof – not offered on the base Touring trim. 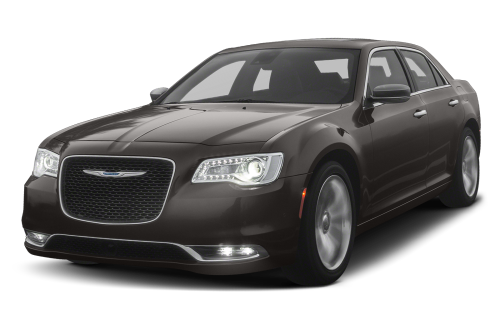 The Chrysler 300S is the only trim standard equipped with black headlamp bezels, while the Limited and 300C come standard with in-reverse auto adjust exterior mirrors, power, heated, chrome exterior mirrors with the option of rain sensitive windshield wipers. Lastly, the Limited trim alone offers bright door handles and chrome exterior mirrors. Standard only on the Chrysler 300 base Touring trim are 17-inch x 7.0-inch premium painted aluminum wheels with option to upgrade to 18-inch x 7.5-inch polished aluminum wheels. Furthermore, the Chrysler 300 Limited and 300C trims are equipped with 20-inch polished aluminum wheels. Standard equipped on the Chrysler 300S, Limited and 300C are 245/45R20 BSW all season performance tires – optional on the Chrysler 300 Touring L.
The 2018 Chrysler 300 is known for its large exterior, so there’s no question that the interior is just as big and spacious. Meant for consumers of all sizes, entering and exiting the vehicle is easy. One of the most appealing interior features is the amount of shoulder room, legroom, head and hip room throughout the cabin. In terms of cargo space, the Chrysler 300 offers an exceptionally large truck, as well as, 60/40 folding seats. While the base 300 Touring trim only offers cloth high-back bucket seats, the remaining trim levels come standard with leather trimmed seats and heated front seats. Additionally, The Chrysler 300 Limited and 300C trims share heated second row seats plus ventilated front seats, which are also optional features on the 300S. Interior convenience features shared by all Chrysler 300 trim levels include a 12-volt center console power outlet and in order to keep the interior cabin air clean, an air filtering system is a standard equipped as well. Additionally, dual zone automatic dual zone air conditioning, front and rear solar controlled glass and a full-length floor console are also some standard features offered throughout all trims. Designed to offer consumers advanced technology at their fingertips, the Chrysler 300 trim levels offer a majority of the available entertainment features standard equipped – one year of complimentary subscription to SiriusXM paired with a two-piece shark fin antenna, 8.4-inch touchscreen display with Uconnect 4C plus integrated voice command with Bluetooth, Apple CarPlay/Android Auto capabilities, customer defined display monitor, dual remote USB port and a GPS antenna input. All trim levels have the option of upgrading to Uconnect 4C with Navigation included in the 8.4-inch display. Optional features on the Touring L, Limited and 300C include a five-year SiriusXM subscription with Traffic and Travel Link service, and GPS navigation. Finally, the Chrysler 300S is the only trim to exclusively have the available option of Beats Audio System, which included 10 premium speakers and a subwoofer. Beats Audio System allows drivers to experience sound as if they were inside an actual recording studio. Fortunately for consumers, the 2018 Chrysler 300 offers exceptional safety features and the majority are standard equipped on all Chrysler trim levels. Some of those features include, advanced multistage front airbags, driver inflatable knee-bolster airbag and electronic roll mitigation. Plus, all speed traction control, auto dimming rear view mirror, electronic stability control, keyless go with remote proximity keyless entry and ParkView rear backup camera. Optional features offered exclusively on the Touring L, 300S, Limited and 300C include blind spot and cross path detection, and ParkSense front/rear park assist system. Lastly, full speed forward collision warning plus and lane departure warning plus are optional on the 300S, Limited and 300C trims. The 2018 Chrysler 300 has a starting MSRP of $28,995 (plus destination fee). Chrysler backs the Chrysler 300 with a three-year or 36,000-mile limited basic warranty, a five-year or 60,000-mile limited powertrain warranty. Chrysler also offers complimentary roadside assistance for five years or 60,000 miles. Find Your 2018 Chrysler 300 At Hollywood Chrysler Jeep!